After spending the morning cutting, splitting, and stacking the remaining firewood on the trailer, Franco and I headed back out to the woodlot with the Scout and trailer for another load. I used the big wrenches to tighten the union on the hose repair, and it is pretty much leak free. With an old dozer like mine (app. 1952) there are leaks in a lot of places. 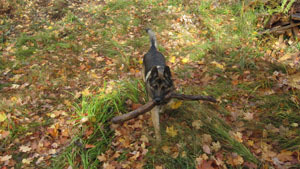 Franco tends not to carry his current stick from home when we drive out to the woods. On this occasion, he found a pretty big hunk of hardwood once we got out there. It is so heavy I can barely throw it, but he seems content, so that is what we go with. Seeing him trotting up to me this afternoon, it looked like he had a large handlebar mustache, so I dubbed him the Franco Bandito, which is a play on the Frito Bandito from TV commercials probably 40 years ago. We had a few setbacks this time out but managed to load up the trailer with a respectable amount of firewood logs, and hauled them back home. Cutting them up will have to wait until tomorrow, as I had a commitment this afternoon. It was another outside project on the edge of a large field. We could see the clouds and the weather coming at us from a long way away in that place. There was sunshine and blue sky one minute, and stinging blowing iceballs the next. The fall season is an amazing time where we live. The trees are rapidly losing their leaves, but there is still plenty of color. The clouds march across the sky and the wind whips you without warning. Lovely. This entry was posted on Thursday, October 11th, 2012 at 8:13 pm and is filed under Uncategorized. You can follow any responses to this entry through the RSS 2.0 feed. You can leave a response, or trackback from your own site.